A two-month long research programme is getting underway for Te Papa Senior Curator Dr Susan Waugh, in collaboration with the French CNRS Research Institute and Polar Institute (IPEV). Susan departs from La Reunion on February 7th to take part in a programme of work on the personality of Albatrosses on the Crozet Islands. 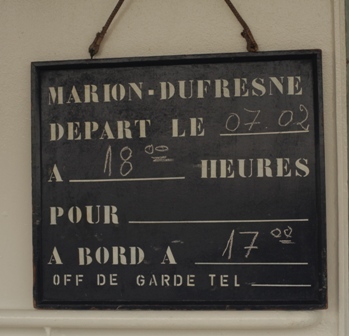 Departure Board of the Marion Du Fresne. Image: Susan Waugh, © Te PapaIt takes over a week to get to the islands, starting at the tropical island of La Reunion, a French Department off the coast of Madagascar. 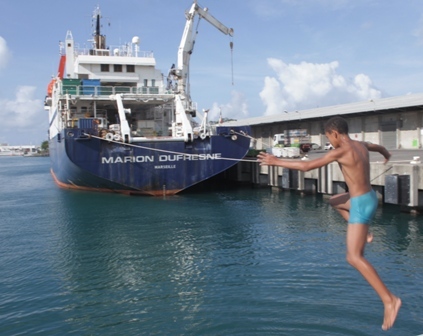 The magnificent 120m French Research Vessel, the Marion Dufresne takes scientists each summer season to three remote French territories in the Southern Indian Ocean. Dr Samantha Patrick from the CNRS is leading the field programme, part of a larger study underway by Dr Henri Weimerskirch on albatrosses of the Southern Indian Ocean. The birds have been studied over several decades, and thanks to this long-term programme, scientists are able to understand how individual birds are making decisions during their breeding cycle. Samantha Patrick CNRS Researcher on board RV Marion du Fresne. Image: Susan Waugh, © Te Papa. This time, there are about 20 researchers on board, all on their way to study the penguins, albatrosses, elephant seals and glaciers of these far-flung sites. Others will be staying on board to take part in an oceanographic research programme. 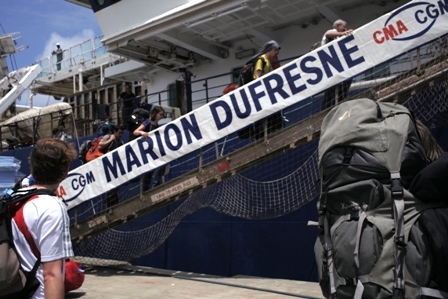 Scientists Boarding Marion du Fresne. Image: Susan Waugh, © Te Papa. Susan’s work during the trip will be to deploy a new variety of satellite tracking device on the wandering albatrosses, and to assist the work of Sam and field assistant Julien, in carrying out personality tests to determine whether individual birds have more or less shy characteristics. This work is being linked to how well birds perform their parenting duties, and how they succeed in finding food in the vast Southern Ocean.